The new project of the Research Center for Mobile Music Making & App Music. 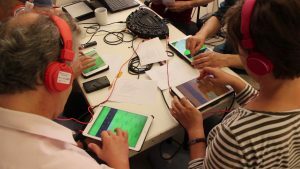 »TOUCH:MUSIC« is the new project of the »Research Center for Mobile Music Making & App Music« at the Berlin University of the Arts, which was founded by Matthias Krebs at Berlin Career College in association with the master degree course Sound Studies. 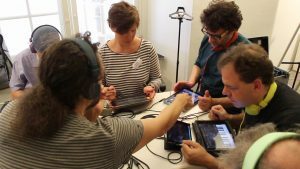 Arranged by the German Federal Ministry of Education and Research (BMBF), TOUCH:MUSIC is a project of the Berlin University of the Arts in cooperation with the Bundesakadmie für Kulturelle Bildung Wolfenbüttel, which will develop a training program for musicians within three years. After having finished the training, the participating musicians are certified to hold music workshops with smartphones and tablets for young adults and children. Marc Godau (music pedagogue and musician) will be joining TOUCH:MUSIC as a research associate. 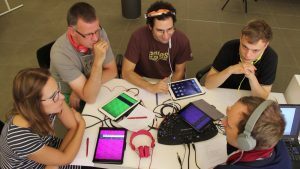 Next to games and social networks, smartphones and tablets also offer apps that enable you to make music and turn devices into instruments, portable studios and DJ-desks. The app’s user interface supports an intuitive handling, which opens up new creative forms of making music. Being part of our every day life as a portable medium, they are perfect for creative and artistic projects inside and outside an educational context. The plan is to implement a training that one can finish with receiving a certificate. Its goal is to establish educational training for professional musicians from all kind of genres to be able to teach children and young adults to make music with smartphones and tablets. The training will be divided into in four phases. In August 2015, the first test training will take place. It will be lead by professionals in this field. During the educational program musicians will be trained to apply their artistic experiences to smartphones and tablets, so they can share their knowledge and support the creative processes of children and young adults outside of school. Possible music projects with apps reach from media installations to classical music, pop music and groovy beats. Next to artistic and practical aspects, questions of mediating and teaching music in the context of a new educational culture are equally crucial to the training program. This advanced training project is a cooperation between the Bundesakademie Wolfenbüttel and the Berlin University of the Arts, funded by the German Federal Ministry of Education and Research (BMBF), thus, the participation will be for free. After having finished the program, the Berlin University of the Arts will award the participating musician with a certificate, which will testify his or her gained knowledge, skills and qualification. 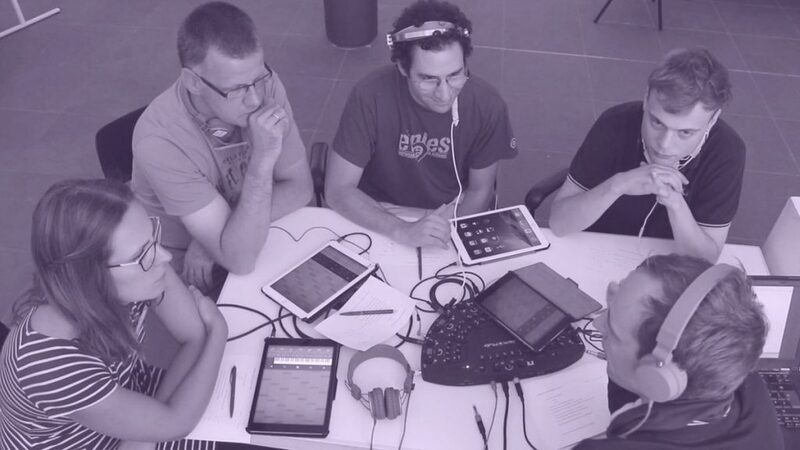 The main objectives of the Research Center for Mobile Music Making & App Music are exploration and systematization of forms of musical practices with apps, to further show connections to current trends in arts and music, and to identify artistic & social dimensions as well as implications for music education. Our main objectives are exploration and systematization of forms of musical practices with apps, to further show connections to current trends in arts and music, and to identify the social dimensions as well as implications for music education.